What do you do when you have a Koenigsegg Agera RS, with its 1,160 horsepower, active aerodynamics, and airbags, but want a little more exclusivity? Easy. You give it a new, made-up name. 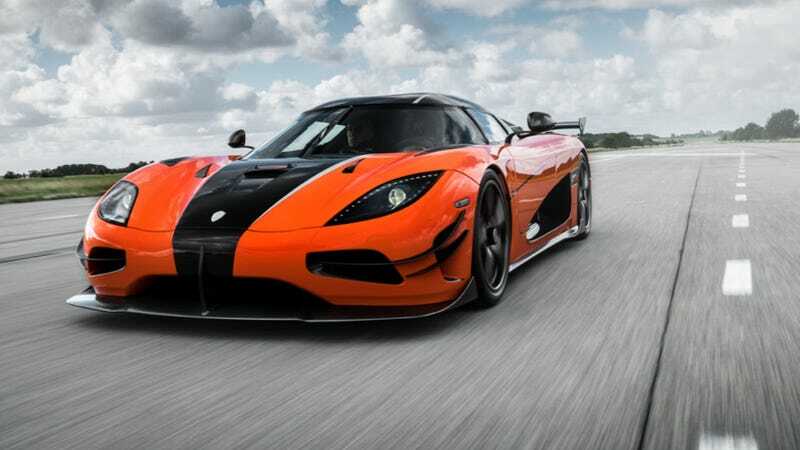 This is the fully road-legal-in-the-United-States Koenigsegg Agera XS. The Koenigsegg Agera RS is already a balls-to-the-wall nutter, as it’s essentially a more livable version of the outrageous (truly, an OUTRAGE! I tell you) One:1. It’s got Apple Carplay and hydraulic suspension to lift it over sleeping policemen and USB outlets, and all at just 3,075 pounds including juices. The Koenigsegg Agera RS showing at Monterey 2016 - badged as ‘Agera XS’ according to the wishes of its owner - will be the first Koenigsegg Agera RS in the United States and will be one of the most powerful, fully homologated, street legal production cars on American roads with the best power to weight ratio. The Agera XS is presented in Karosserie Orange - an intense orange finish with diamond-dust metallic effect - and a clear carbon centre strip. The interior features black alcantara with orange contrast stitching to match the exterior. The Agera XS also comes with bespoke aerodynamics, including the largest rear wing ever fitted to a Koenigsegg, specifically designed to the owner’s wishes. The Koenigsegg Agera XS is set to make its debut at Pebble Beach later this week, along with the fully production-ready Regera. We’ll be there to check it out. Update: Kris Singh, the actual owner of the Agera XS wrote in to clarify that it has the 1,340 HP engine of the One:1, not of the RS. In addition to that, the XS has a custom front and underbody to improve aerodynamics.